Ready for the awesomeness that is Ubuntu Opportunistic Developer Week, we have a shiny new Lernid for you all to rock the week with. Lernid is the online learning tool for getting the most out of our learning weeks. It makes connecting a doddle and provides interactive features such as showing slides, web pages and more. Kudos to Michael Budde for taking over the reigns on Lernid as the new maintainer, and for the fantastic little Lernid community for making such a stunning release! You’re an American now, Jono.. here we call it a ‘ton’. Honestly I don’t know how many pounds are in a ton(1000 or 2000? 1024? )… so I’d prefer megagram in literal situations, which this is not. 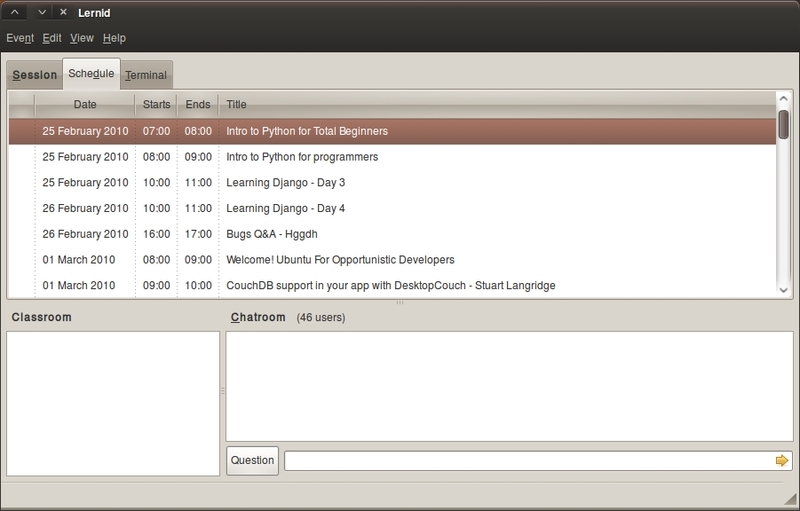 I am totally digging the “Question” button interacting with ClassBot – nice collaboration there with Nathan and Chris. Good stuff guys. What I’ll do actually next week is email our manual mailing list and ask for some feedback or feature requests on how they think Lernid performed, both from the teacher and the student perspectives. I’ll summarize them and send them to you and mbudde. Have a sweet weekend dude, talk next week! amazing, alarming, astonishing, awe-inspiring, awful, beautiful, breathtaking, daunting, dreadful, exalted, fearful, fearsome, formidable, frantic, frightening, grand, hairy*, horrible, horrifying, imposing, impressive, intimidating, magnificent, majestic, mean, mind-blowing*, moving, nervous, overwhelming, real gone, shocking, something else, striking, stunning, stupefying, terrible, terrifying, wonderful, wondrous, zero cool, fascinating, incredible, marvelous, prodigious, shocking, stunning, surprising, unbelievable. Even more importantly, you squished the issue that might have allowed people to accidentally send private messages in the public IRC channel… nice work 🙂 and I do like the new icon. Ignore previous post. Worked after I removed some earlier versions of the PPA. Really love the idea of Lernid but tried to get onto the Python session yesterday and failed because my employer is blocking IRC. Any way of setting up Lernid to use some kind of proxy? I have the same problem (except it’s my university that’s blocking the connection.) I haven’t found a way to use a proxy with Lernid, but using http://webchat.freenode.net worked perfectly for me. Yep, the webchat works well but it’s very cluttered with arrivals/departures so I found it rather hard to follow. (Oh, and my employer is a university, so same situation)! Give me a proxy list!!!!!!!!!!! !